After my escape from the craziness of Songkran in Chiang Mai, I made it to the relaxed and ancient old town of Sukhothai in central Thailand. 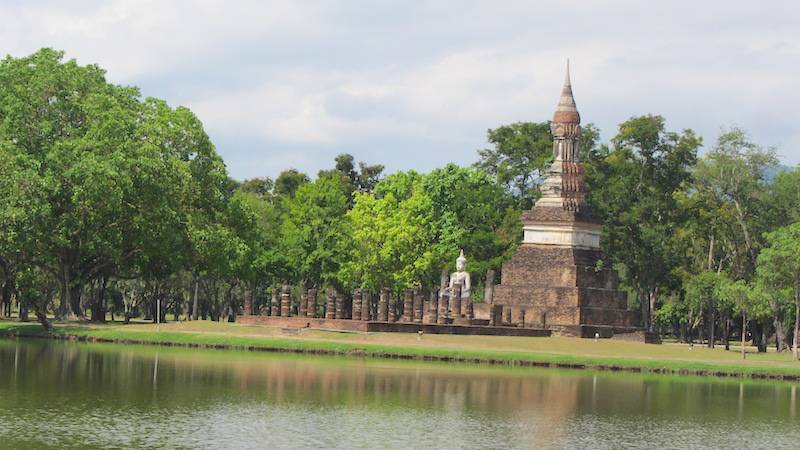 Sukhothai Historical Park was by far one of my highlights of my Thailand Itinerary – Sukhothai, Sukhothai, so beautiful I could cry! The bus was a Wintour bus from Chiang Mai bus station 2 to Sukhothai Old City (Sukhothai Historical Park). I booked 2 days in advance and plenty of seats even post Songkran. It was air conditioned and very comfortable. Roads are good and bus travel is nice – it’s much easier than expected travelling around Thailand. I paid just 207 baht for the ticket for a 5 hour journey from Chiang Mai to Sukhothai. There were two 5 minute toilet stops on the bus from Chiang Mai to Sukhothai – one in Lampang and one in Tak. Remember when you get off in Sukhothai you need to know if your hotel or hostel is in the Old town Sukhothai near the Sukhothai Historical Park or in New Sukhothai (Sukhothai Thai) about 12km miles to the East. My accommodation of choice was a lovely private room and en suite at the Old Pottery House in the old city. My hosts Mike and his sister Usa gave me a wonderful welcome and helped me to organise everything, including a private electric bike with driver for the historical park the next day. I was provided with toiletries, tea and coffee and a wonderful Thai breakfast. 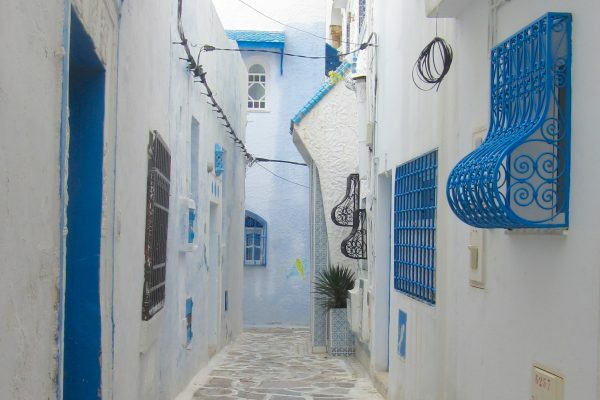 The Old Pottery House was so homely and a wonderful experience where I felt that I was treated like one of the family. There are children there who are really cute and a lovely dog called Brownie. If you are looking or somewhere to stay in Sukhothai I really recommend the Old Pottery House. 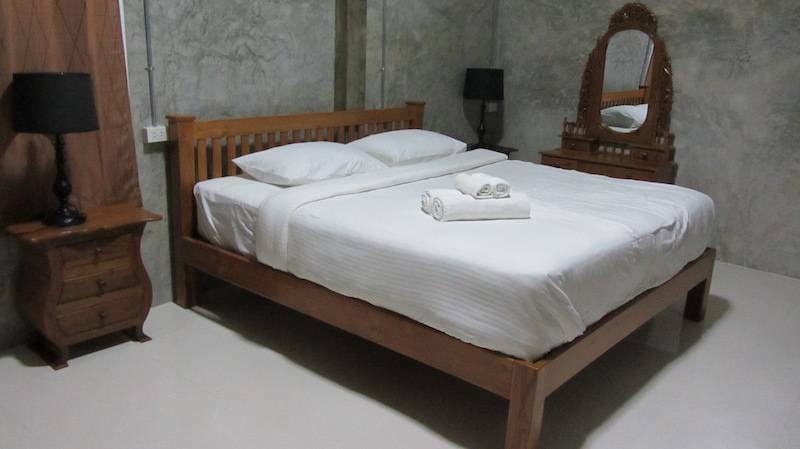 It was 750 baht per night which worked out at around £16 per night for private double – very cheap. Sukhothai Historical Park is an ancient city that used to be the capital of Northern Thailand ‘Sukhothai’ in the 13th and 14th Centuries. Almost 200 temples were uncovered and reconstructed. 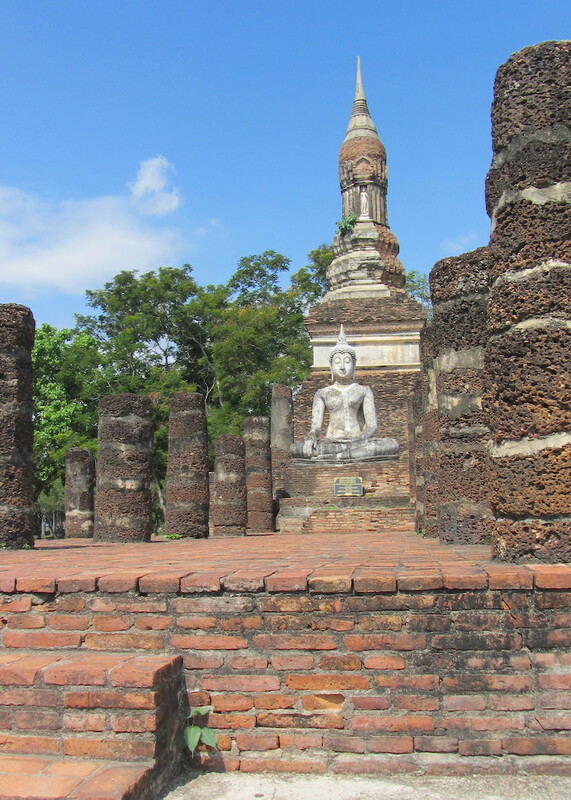 Sukhothai is a UNESCO World Heritage Site and home to vast ruins and giant ancient Buddha statues in a scenic park setting – it’s breathtaking. 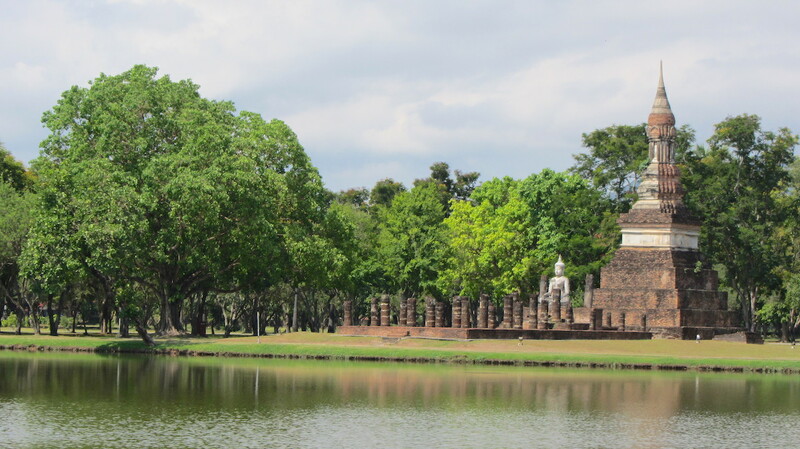 Sukhothai Historical Park is much bigger than you might expect it to be. It’s quite a distance between the temples and so although some walking is possible, you really need to hire a bike or an electric scooter to cover more ground. I think I only paid around 800 baht for the day (Just under £20!) and this involved being taken around in the guys car at the end of the day to find some of the outlier temples. Plan how you will travel around the park and purchase your ticket as you enter at the West Gate (ticket office is number 4 on the map). You can then work your way around the main temples – Wat Tra Phang Ngoen (20), Wat Si Sawai (16), Wat Mahathat (12), Wat Tra Phang Thong (22), Wat Sa Si (15) and Wat Sorasak (18).The map below is featured on ThailandSawadee.com and the full map and key can be found here. Head straight to the centre of the historical park to Wat Mahatat, which is one of the most spectacular temples and a good starting point. Wat Mahatat is the most splendid and impressive Wat with a stunning mountainous backdrop. 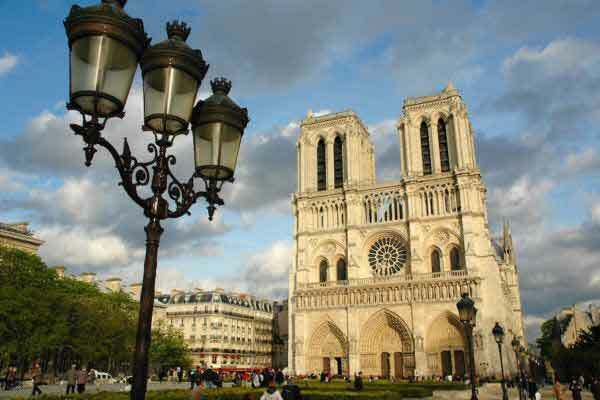 It was near the ancient palace and when fully constructed had 185 chedis and four wiharns (prayer halls). The tip peaks as a lotus bud, representing enlightenment. Wat Si Sawai is instantly recognisable by its three prang Kymer style temple, which was originally a Hindu temple dedicated to Shiva (the God of destruction). 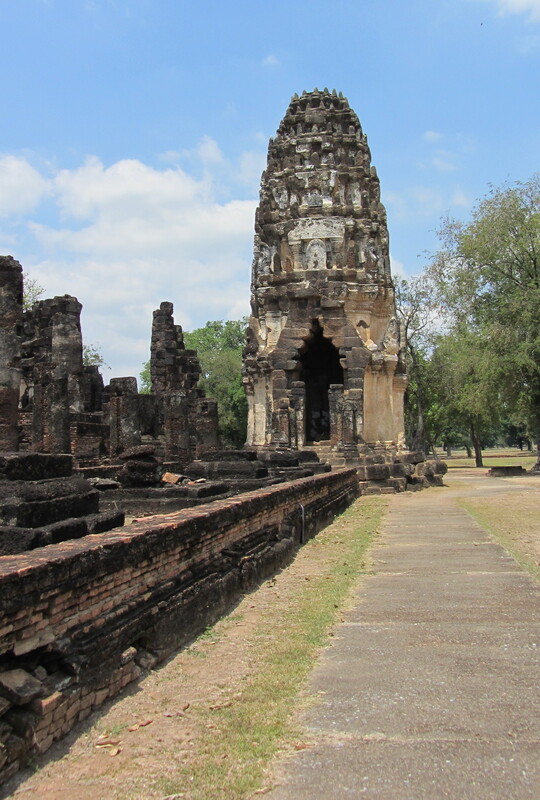 It is one of the oldest temples in Sukhothai Historical Park. Wat Tra Phrang Ngoen is a traditional Sukhothai style 14th Century temple with a sitting Buddha in front of a lotus tipped Chedi. The temple also includes an image of a walking Buddha. Wat Sa Si is a beautifully positioned on an island in the Tra Phang Tra Kuan pond, surrounded with lotus flowers which represent enlightenment. 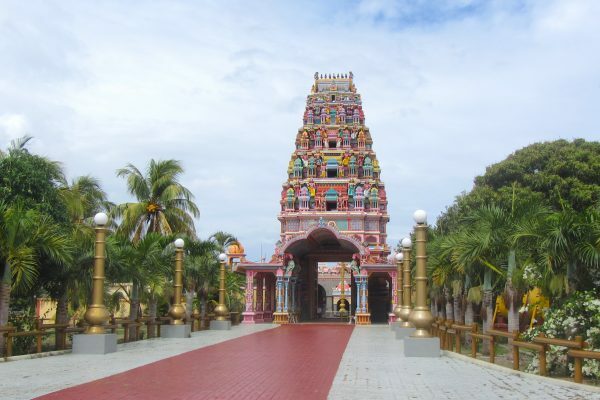 A foot bridge joins the temple to the main complex. 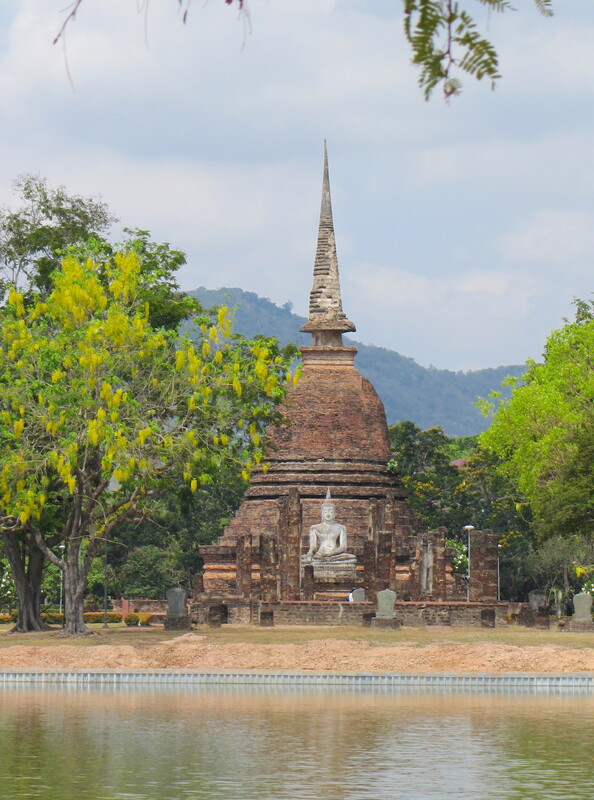 Wat Sa Si dates to around 14th Century and has a Singhalese bell style chedi with a stone seated Buddha in front. The base and pillars of the bihari (prayer hall) remain. Buddhas have their hands in different mudras or hand positions, which all have different meanings. The mudra of the stone seated Buddha is the Bhumisparsha mudra, also known as “calling the Earth to witness”. 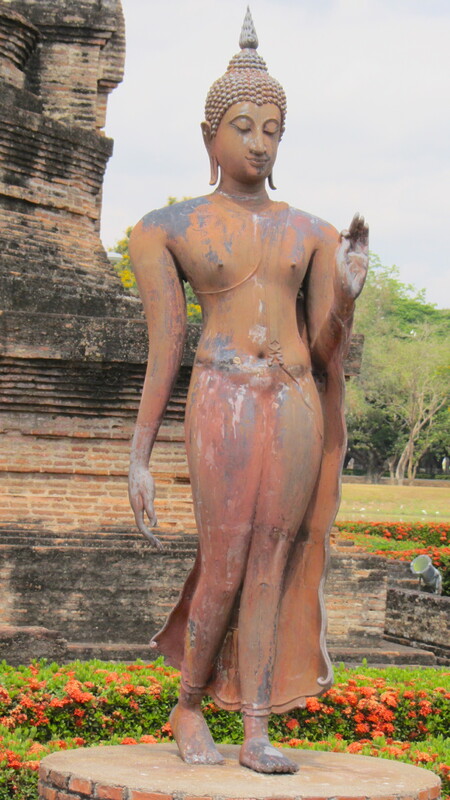 There is also a standing Buddha at Wat Sa Si on a circular pedestal, in the Vitarka mudra, the gesture of teaching. 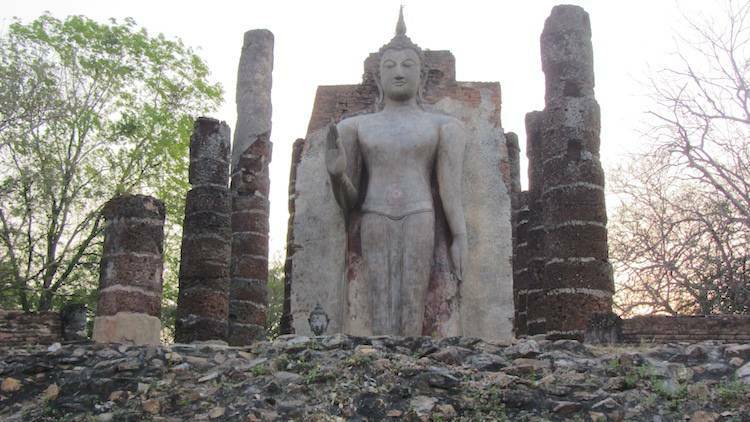 The Buddha’s here in the Vitarka Mudra at Sukhothai Historical Park are some of the most famous in Thailand. Only a single Prasat style Khymer prang is now standing at Wat Phra Phai Luang, although there were originally three. It is another one of the earlier temples (late 12th Century). 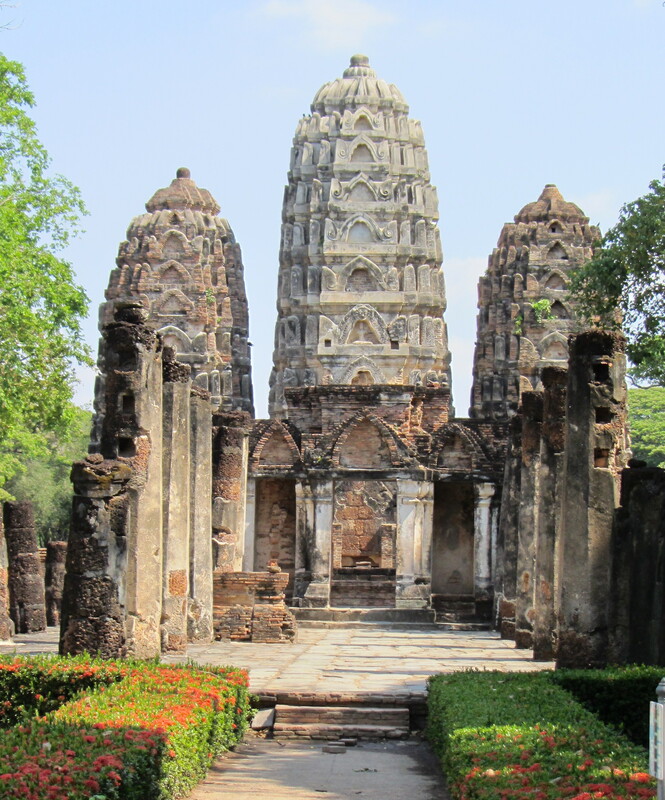 Originally a Hindu temple, it was initially dedicated to Vishnu, and then became a Buddhist temple in the Sukhothai period. 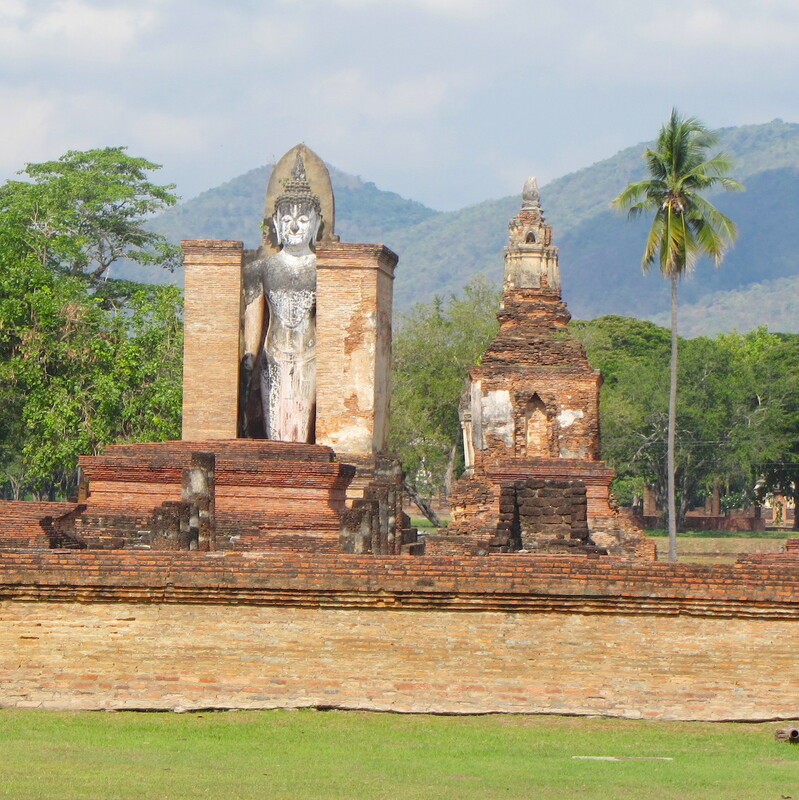 Located just outside the main city wall on the North side is Wat Si Chum. 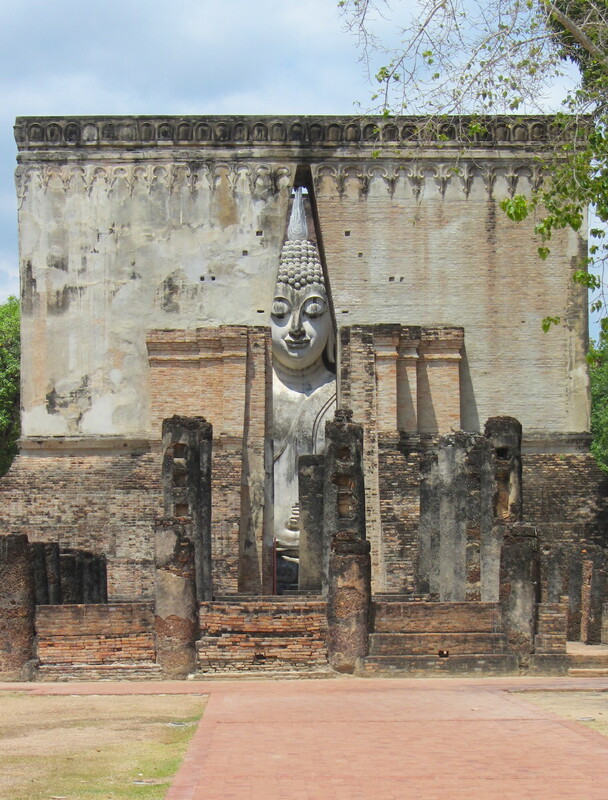 This is a Mondop (cupboard temple structure) housing the biggest Buddha in Sukhothai Historical Park. The name ‘Wat SI Chum’ means temple of the Body tree, and it was the Bodhi tree, of course, under which the Buddha gained enlightenment. Rows of pillars from the old bihari (prayer hall) remain in front of the Mondop. Inside the roofless Mondop you will find the Phra Achana Buddha image (he is not frightened or ‘speaking Buddha’. This stone Buddha is 15m high and 15m wide. The hands are once again in the Bhumisparsha mudra (like at Wat Sa Si) and the right hand is coated in gold leaf. 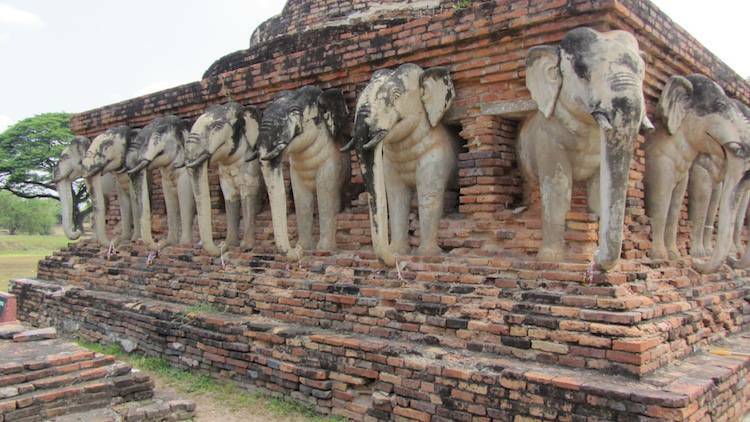 Located in the central area, Wat Sorasak is a stunning Chedi in Sukhothai style surrounded by elephants. 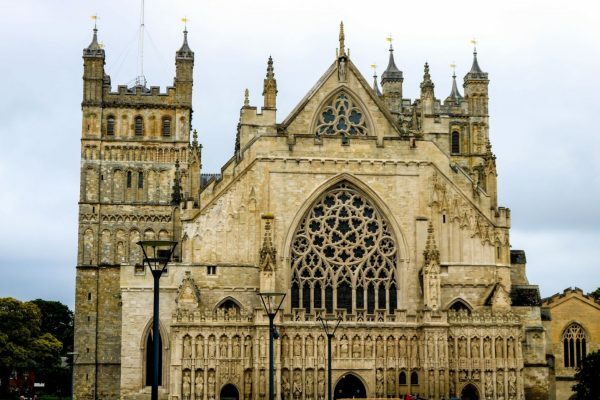 It dates back to 1412. 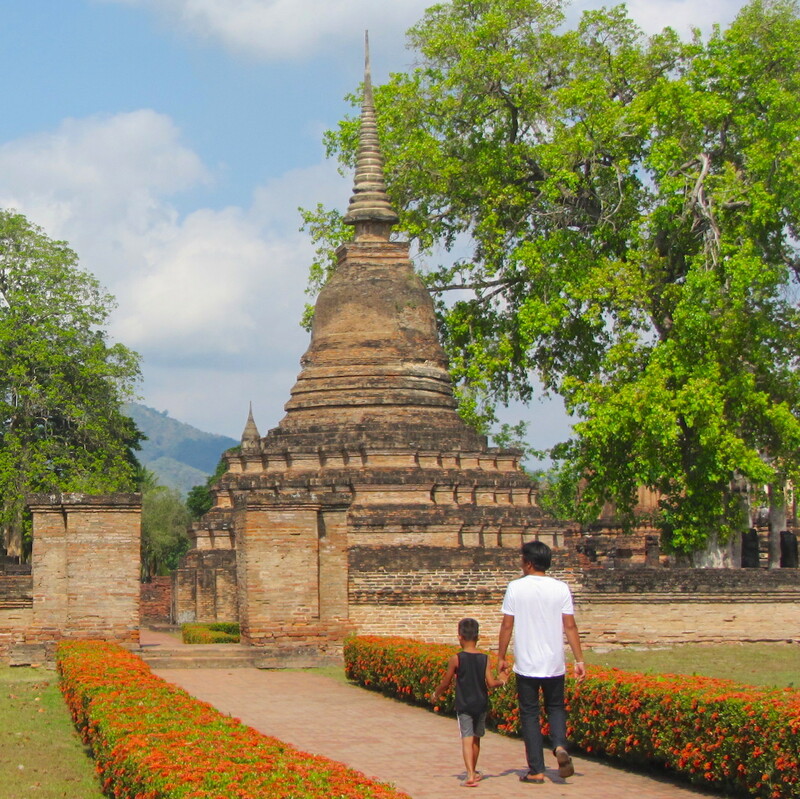 How long should I spend in Sukhothai? 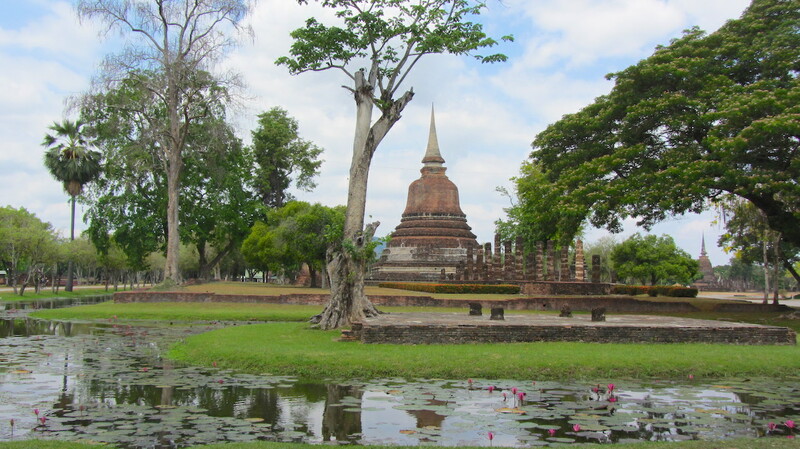 I would recommend at least 1-2 full days at Sukhothai historical park. It’s also quite in the middle of no-where, so it’s not worth trying to do this as a day-trip. 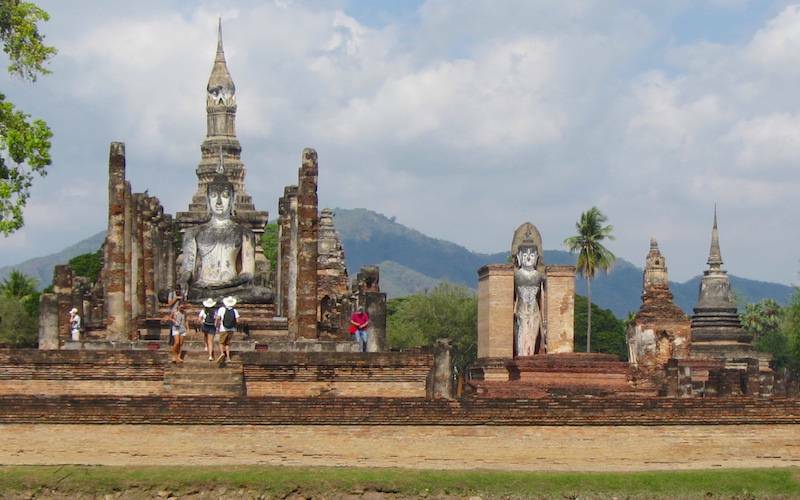 Spend three days if you want to explore the outlier temples and modern or new Sukhothai as well (Sukhothai Thani). Outside the main old city walls you can find several remote outlier temples – I highly recommend taking a car out to see these, or taking a second day to admire the more remote temples of Sukhothai historical park. My favourite of the outlier temples was Wat Saphan Hin with it’s beautiful standing Buddha at the top of a staircase. I also recommend seeing Wat Chetuphon in the South and Wat Chide Sung. 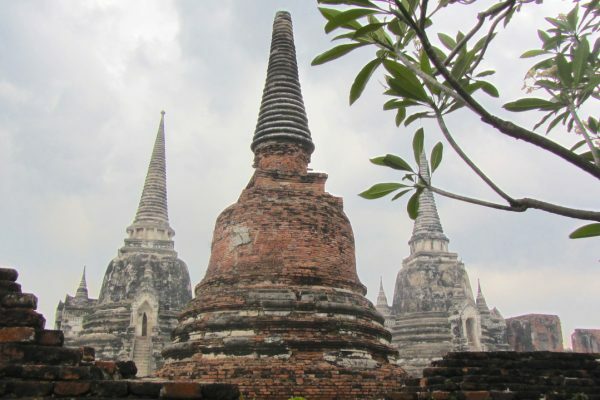 If you are enjoyed Sukhothai, I also recommend taking an Ayutthaya Day Trip from Bangkok. Whilst spending time temple seeking in Thailand, don’t miss Wat Doi Suthep (Chiang Mai) and the Blue Temple (Chiang Rai).